The performer removes a finger ring from his finger, the ring vanishes completely and instantly reappears back on his finger. * Key points – Any ring can be used, no difficult sleights, easy to do! A coin is borrowed or provided by you and then signed by your spectator with a sharpie. You then cleanly push the coin through your head, showing your hands empty throughout the effect. No switches or duplicate coins are involved! Every great magician did it. Every book tells you to do it. Take notes. Write it down. Document your ideas. But ideas come at the strangest times: in the middle of a movie, during conversation, at lunch-none of your ideas will ever be forgotten again. 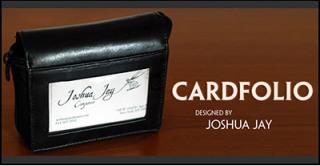 Cardfolio is obviously for the close-up magician who thinks seriously and critically about his own work.